"Dog hip replacement is a common veterinary procedure with over 90% of dogs seeing a positive result. The total hip replacement (THR) surgery involves the removal of the acetabulum (sides of the pelvis that hold the femur bone)and the top of the femur bone. The prosthetic replacement uses a light weight polyethylene cup attached to the pelvis and the replacement of the top of the femur bone with a new femoral head (top of the bone that attaches to the pelvis) made out of a cobalt chrome ball and stem. Both are held in place with a substance called polymethylmethacrylat"
A dog hip replacement is a surgery that is usually performed when a dog has injured the head of the femur (where the leg attaches to the joint), severe arthritis, canine hip dysplasia. It may be performed for other reasons as well, such as if the hip is fractured due to trauma. The goal is to provide the patient with a fully functioning pain free hip. To understand how dog hip replacement surgery works, it is helpful to understand a little about the anatomy of the dog's hip. 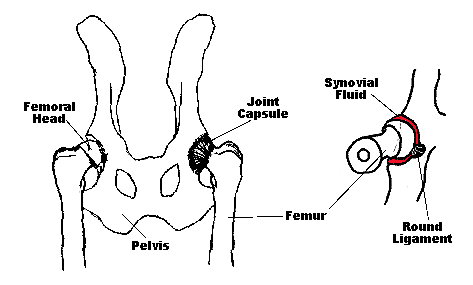 The hip is a joint between the femur (thigh bone) and the pelvis. It is a ball and socket joint. The head of the femur is the "ball" and the acetabulum, part of the pelvic bone, is the "socket". Cartilage lies between the bones to cushion them. The ball is supposed to fit snuggly into the socket. Arthritis occurs when the cartilage begins to wear thin and bone rubs on bone. With arthritis, the joint also becomes inflamed. It may occur in one or both hips, but usually occurs in both. Hip dysplasia is an abnormally formed hip joint. The ball does not fit snuggly into the socket, but instead fits loosely into the acetabulum. This often leads to the development of arthritis. It usually occurs in both hips. The surgery is only performed on one hip at a time, however. Dog hip replacement is only done in fully grown dogs, dogs at least 12 months of age. Dogs must be in good health in order to have this surgery. Surgery is done on dogs of all sizes (it used to be limited to larger dogs). The replacement hips come in different sizes to allow for a good match between your dog and the new hip. To determine if your dog is a good candidate, a veterinarian will take x-rays of the area to assess the overall condition and to judge the probable success of the procedure. The area will need to be full grown before the surgery can be done. In terms of younger dogs, they are usually good candidates starting at age 12 to 14 months. If a dog needs both hips replaced, one will be done, and after full recovery, the second hip operation can be performed. In canine total hip replacement (THR), the "ball" of the joint is replaced with stainless steel and the "socket" is replaced with high density plastic. The head of the femur is cut off at an angle, then the tissue is removed from the marrow cavity of the bone. Next, the cartilage is removed from the joint. Some of the bone is removed from the socket and holes are mode in the bone for cement that will hold the plastic socket. The plastic socket is then cemented in place. The marrow cavity of the femur is then filled with cement and the ball is locked into place. The "press fit" system uses a tight fit combined with bone growth to stabilize the hip. It doesn't require the use of any cement, avoiding problems such as thermal bone damage. Instead of cement, the implant is held in place via the fit between the femural head and the socket. This is, of course, an invasive procedure, and care must be taken to keep the wound clean in order to avoid infection. 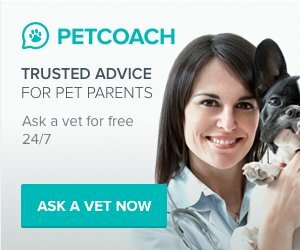 Your vet will show you how to care for your dog when you take him home. Dogs are usually in the hospital for 2 to 3 days. Recovery takes approximately 3 months. Exercise must be restricted for about three months following the surgery. You should take your dog out on a leash (don't let him run free in the yard) and limit the length of his walks. Avoid slippery floors after surgery. The leg may be held in a splint to avoid further injury until recovery is achieved. Dogs will require some pain medication and physical therapy during the recovery period. An x-ray is taken after the 3 month period, at the 1 year mark and 2 year mark to make sure everything is in the proper location. Over 90% of hip replacements are successful. Most dogs show fast results and can start to use the leg that was operated on in several days after the surgery.